30 Night Diet Review: Is This the Answer to Your Diet Needs? 30 Night Diet is a weight loss pill designed by Creative Bioscience for individuals who want to keep losing weight while they sleep. It is a stimulant-free diet supplement that can be taken in the evening to maximize weight loss results from night until morning. According to the official website, this product contains no ingredients that could keep a user from obtaining a good night’s rest. 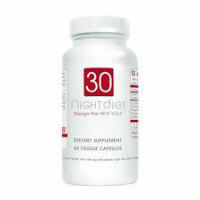 The 30 Night Diet formula contains Vitamin C, Lychee, African Mango, Raspberry Ketones, Caralluma Fimbriata, Griffonia Simplicifolia. Each of these ingredients is believed to be beneficial for weight loss in one way or another. For instance, raspberry ketones are believed to help shrink fat cells. African Mango curbs hunger cravings and boosts metabolism and energy levels. Lychee targets stubborn visible fat. Carallum Fimbriata helps the stomach feel full faster and delays gastric emptying so you feel fuller longer. Griffonia simplicifolia (5-HTP) is thought to be a powerful appetite suppressant and can improve mood by countering depression and insomnia. Based on the above ingredients list it seems that the website has kept its promise that the product is stimulant-free. However, taking this pill isn’t going to result in you losing more weight before you sleep or while you sleep. For starters, there is no proof that any of these ingredients can actually suppress appetite or boost metabolism in a significant way that will aid with weight loss. Even if they did work and they helped control late night snacking, they won’t help you burn any more calories than you naturally do while you sleep. Shedding fat isn’t just about not having a late night snack; it’s about being physically active. As such, taking 30 Night Diet isn’t going to help you blast fat off your body in any real significant way. This is imply because you can’t combine it with one of the most effective forms of weight loss: exercise. Furthermore, just because this product does not contain stimulants, this does not mean that it is without negative side effects. The most common side effects to watch for are gastrointestinal symptoms, headaches, and dry mouth. The risk of side effects is greater if you have sensitivities to any of these ingredients. Prior to taking 30 Night Diet, it is strongly recommended that you first speak with your healthcare provider to determine if this is a sensible and safe product for you to make a part of your weight loss regimen. This entry was posted in Non-Prescription Diet Pills Reviews and tagged african mango, caralluma fimbriata, Griffonia Simplicifolia, Lychee, Raspberry Ketones, vitamin C on November 2, 2016 by Diet-Pills.cc.